As the healthcare industry transitions to an electronic record system, the way health information is being collected, processed, and used is being radically reinvented. New HIT/HIM graduates are entering a changing field where their training and credentialing must reflect all the emerging needs and demands of healthcare organizations. Newcomers are expected to have practical, hands-on experience and have completed a curriculum that reflects the profession’s evolution. According to a 2009 report from the President’s Council of Economic Advisors, employers said, “Professionalism/work ethic, teamwork/collaboration, oral communication, and critical thinking/problem solving are among the most important skills labor market entrants need.” Qualifications that employers are seeking from HIT/HIM professionals, according to AHIMA research, can be categorized into three key areas: strong knowledge of the healthcare industry and how information is used, skills required to perform the specific HIM domain role (managerial, technical, data analytics, etc), and attributes for success in moving change, such as critical thinking, problem solving, flexibility, and communication. With this in mind, there are five skills that HIT/HIM students must learn as the healthcare system continues to transform: effective communication, the ability to use health information technologies, the capability to work in an online (vertical) environment, team building, and critical thinking. Good communication is one of the most important skills HIT students can master. Effective communication involves more than engaging in casual conversation, sending e-mails, or talking on the telephone. HIT professionals are required to be proficient at communicating in various mediums and at different levels of the healthcare system. An HIT curriculum should include more writing assignments and group projects that help students improve their communication skills. HIT professionals are expected to communicate regularly with providers, IT specialists, healthcare administrators and, in some cases, patients. To meet this expectation, students should engage in activities, exercises, and assignments that will build their writing and presentation skills. Technology has changed the way people communicate. Forget phoning; now there is e-mailing, texting, blogging, Web posting, and instant messaging, all of which don’t involve verbal skills. Therefore, it is critical that HIT students are provided ample opportunity to deal with both written and verbal communications. In the past, students often honed their writing and grammar skills in their English or composition courses and then matriculated through the HIT program. Today, HIT faculty are obligated to invest more time, resources, and planning into teaching grammar, writing, and presentation skills if they are to produce graduates who will meet future healthcare needs. Faculty may find it helpful to record presentations so that students can review how they sounded and what their body language was like. According to the Office of the National Coordinator for Health Information Technology, HIT makes it possible for providers to better manage patient care by securely sharing health information. As HIT professionals continue to set standards for EHRs and other emerging technologies, HIT students must become fluent and proficient in using these health information technologies. To create an interconnected healthcare system, a workforce capable of innovating, implementing, and using HIT must be in place. As a result, educational programs must ensure their curricula reflect what students need to know for careers in electronic healthcare environments. The curricula must include the latest developments in HIT/HIM practice and provide new learning tools, such as a virtual learning lab, that give students experience in an electronic environment. According to the AHIMA, an effective workforce is contingent on those who must use HIT and EHRs to perform their duties. Employers expect new graduates to maneuver through IT applications with familiarity and relevancy. To provide students with this level of comfort, HIT curricula must incorporate mock health information technologies. At a minimum, HIT students must become experts at basic computer skills, have access to the latest EHR tools and applications, and participate in practice lessons for skills reinforcement. As technology becomes more prevalent in the healthcare delivery system, HIT students will need to become adept at working in an online environment. As a result, newcomers will need to read and analyze information remotely on a computer as opposed to using paper documents. 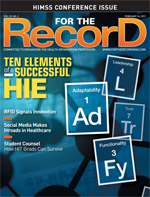 EHRs will change how and where HIT/HIM professionals work. Traditional HIM roles, such as coding, transcription, record completion, release of information, and auditing, are moving into new virtual workflows that facilitate connecting from practically anywhere. While not all HIT academic programs are online, students must be taught to learn in an electronic and technologically advanced environment to better prepare for the future. HIT programs should incorporate software tools and applications that mirror the electronic healthcare system students will encounter when entering the profession. Seasoned HIT professionals may be accustomed to working remotely and independently. Nevertheless, the ability to work well in a team setting is a critical skill that HIT programs must teach and practice. Healthcare professionals often work collaboratively with colleagues and others outside their department. Projects such as tweaking the chart retrieval process, introducing a new form into a paper record, and building a new EHR screen require cooperation between various hospital departments if they are going to be successful. HIT professionals also work with other departments to investigate workflow process improvements and redefine HIM practices. When a curriculum embodies exercises, projects, and assessments that practice group dynamics and professional ethics, students are better prepared for such real-world encounters. According to the President’s Council of Economic Advisors’ report, employers are seeking workers who can think critically and solve problems. Basic writing, spelling, and grammar skills, coupled with the applied skills of problem solving and interacting with others, are pertinent for workers in the current labor market, says Donna Klein, president and CEO of Corporate Voices for Working Families. As the healthcare industry undergoes dramatic changes, “paying close attention to detail” has evolved into “thinking critically.” It is no longer good enough to merely identify or point out details; HIT professionals are expected to be able to make analytical determinations based on their knowledge and experiences. For example, as the healthcare industry evolves, the AHIMA says it will still be important to teach how to code, but it will be more essential to promote critical-thinking skills that focus on the analysis and reporting of data sets and the assurance of quality data. These skills will become paramount over the next decade as demands for accurate data grow as more providers make the switch to an electronic environment. For motivated HIT/HIM students who recognize the opportunity that lies ahead, it’s never been a better time to take advantage of allied health curriculums that meet their growing needs. — Hertencia Bowe, MSA, RHIA, the national HIM coordinator for the Rasmussen College School of Allied Health, oversees the development and expansion of the college’s health information program and its curriculum.